This system's name itself gives away the strategy of this system. This betting system stands on a betting pattern that comprise of one unit then three units, then two units, and then six units. This kind of betting system used in blackjack stands on the gambling system called Paroli system. This system mainly stands on the principle that a player can win four times one after the other. When it comes to the nature of this system, this system is positive progression wagering system. This implies that you should add to the amount of your bet only when you win. When a player employs this betting system, the initial bet is of 1 unit and then this bet is followed by a bet if three units and then the third bet comes to two units and the next bet is of six units. For instance, assume that each unit is equal to five dollars and your odds are even that is of 1:1. Then your initial bet will be five dollars. Subsequent to wining the bet, five dollars will be added to ten dollars that are on the blackjack table. This makes the subsequent bet of fifteen dollars. When you win this bet, you get a sum total of thirty dollars on your blackjack table. You should now take back twenty dollars and so the third bet comes to be of ten dollars. In case, your third bet again wins then you will possess total twenty dollars on the blackjack table. Put in ten dollars making a sum total of thirty dollars this makes your fourth bet. 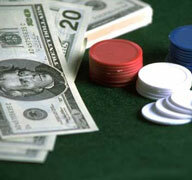 In the end, if the final bet wins then the total will be of sixty dollars that is left on the blackjack table. This is your complete net profit. Once you complete the cycle of betting you can then loop back and begin all over again. In case, this time you lose the wager prior to completion of the wagering cycle, you can start back over along with the initial bet of five dollars. This betting system is a very attention-grabbing policy. With this scheme, you risk a very tiny sum to win a larger amount of money, if you finish off the cycle of betting. You can also lose all the six times, but can still cover yourself completely by winning all the four bets of this cycle at one time. This system is usually not recommended until you are playing just for fun. You need to win all four bets to make profit. That is why this system will be fun for recreational players and is not for serious players who play blackjack.